First Lady Melania Trump was heavily criticized by journalists on Twitter on Tuesday for wearing black stilettos as she boarded Air Force One to fly to hurricane-ravaged Texas, but when she exited the plane, the first lady was wearing sneakers and a "FLOTUS" ball cap. 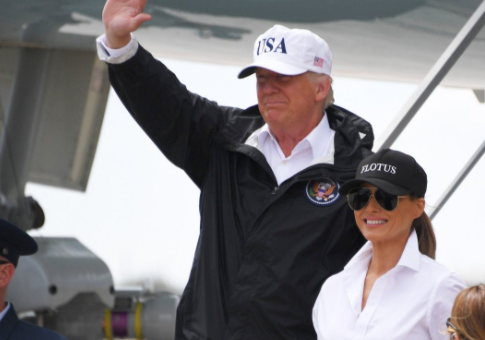 President Donald Trump and the first lady flew to Corpus Cristi, Texas, where they met with Gov. Greg Abbott (R., Texas) to assess what needs to be done to help those affected by Hurricane Harvey. Abbott said Trump will not be visiting Houston, a city still experiencing extreme flooding. After pictures of the first lady were posted on Twitter early Tuesday morning, several journalists and Trump critics mocked her stilettos and asked whether she was "prepared" for the storm. Some questioned the practicality of the first lady's choice, others deemed them representative of her being "out of touch," and some wished the worst for her. I know it's unsisterly to mention Melania's shoes but she won't have them long once they get to Texas and that house lands on her. When Trump exited the plane, she received largely positive reactions for wearing a "FLOTUS"—First Lady of the United States—hat and a pair of white sneakers. The first lady's communications director responded to criticism of the stilettos, saying it was "sad that we have an active and ongoing natural disaster in Texas, and people are worried about her shoes." This entry was posted in Culture and tagged Donald Trump, Greg Abbott, Melania Trump. Bookmark the permalink.